Technology company Nvidia has been the leader in the graphics market for a while now, with their GeForce graphics cards powering millions of PCs the world over. Nvidia recently launched its new line of graphics cards, the GeForce RTX cards. These are the first PC consumer graphics cards to feature ray tracing, a rendering technique which makes games look incredibly real for those with a PC powerful enough to make the most of it. But while most gamers are content to settle for a consumer card like the GeForce GTX 1060 (a popular mid-range card featuring last-gen technology), Nvidia has also been offering its Titan series of graphics cards for some time now. These cards not only pack some serious punch, but come with a hefty price tag attached to them too. And it’s not surprising that Nvidia is now gearing up to launch a new Titan graphics card now that its new line of GeForce RTX cards has hit shelves, as was recently reported on PC Gamer. The new Titan RTX card comes in at a whopping $2499 US dollars, and packs in some serious hardware too. For starters, it’s got twice the amount of memory a RTX 2080 Ti card comes equipped with on board: a stunning 24 GB, a record for a consumer PC graphics card. It also boasts higher clock speeds all round than the 2080 Ti model, and a 384 bit memory interface. Also interesting is the fact that Nvidia is bringing back SLI connectivity to the Titan line, meaning you can connect to of these cards together for an enormous performance boost (assuming you can afford to get two of these, of course…). 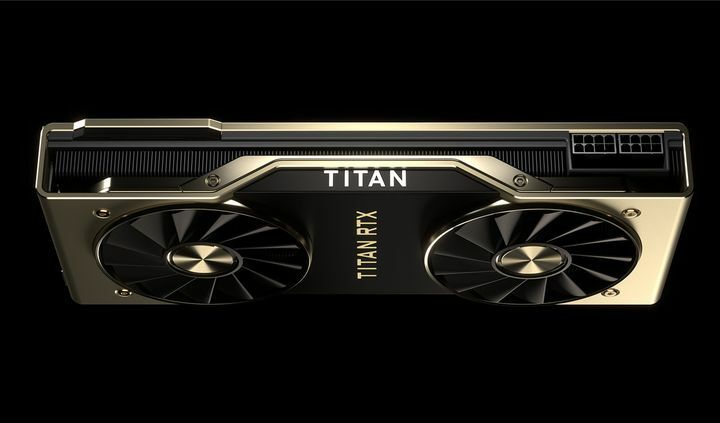 However, one of these Titan cards should be enough for most people: as PC Gamer points out, you should expect up to a 20 percent performance gain over the RTX 2080 Ti from one of these cards. The RTX 2080 Ti can cost up to $1000 US dollars less depending on the model, so getting a Titan RTX seems more about bragging rights than anything else though. Nonetheless, it’s still great to see Nvidia push the boundaries of PC graphics technology, and hopefully we’ll see more games make use of the RTX cards’ ray tracing capabilities in the near future.